HOCHIKI has invited Ian Watts to talk about issues surrounding emergency lighting design. Ian sits on BS 5266 part 1 as the independent industry expert on new technologies and has been lecturing on the ICEL competent engineer course and advanced maintenance and testing course for the last 3 years. The system should protect users from the risks generated by sudden failure of the mains lighting supply. The code of practice BS 5266-1 not only specifies requirements for high risk task areas, but it also makes recommendations for areas which are not normally hazardous. The system should protect those occupants who may be staying in the building during the supply failure. Some occupants such as residents in care homes, may be difficult to evacuate and subject to a stay put policy, in which case the refugee locations need to be assessed for emergency lighting. In other areas it may be decided that occupants can stay put; either to work or for leisure activities. In this case it is important to ensure that their evacuation route is still viable even if the supply failure continues for an extended period. Current legislation, although very in-depth, doesn’t account for unique building features; it is therefore the responsibility of the risk assessor to design a system that compensates for any additional risks to the occupants. It is also important to ensure that the emergency lighting design compliments the design of the existing fire alarm system. For example, addressable fire detection systems give precise information of the location of smoke in a building, this information can be used to create intelligent escape routes. 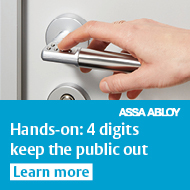 Automatic testing becomes more important particularly if occupants are staying in the building. It is important for the operator of the premises to be confident of the emergency duration available from their emergency luminaires. Communication between components and systems are increasingly important; not only to monitor testing, but also to control operation. For example, consider enabling maintained exit signs to be switched off from a central point when the building is empty. LEDs Offer high operating efficiency due to their extended life expectancy and lower energy consumption; this therefore reduces maintenance costs. They are also compact and can be produced as attractive luminaires. There are great advantages to luminaires that use lithium batteries and potentially other power sources such as super capacitors. It is worth investigating all options available.